It’s been a while since I’ve posted on here, partly as I slipped out of the habit and partly as there seemed less to report. But today definitely feels like a good news day. A recurring question before Rhys had his surgery was ‘why isn’t SDR available on the NHS?’. There were a number of reasons which I’ve written about on this blog before. If you cast your mind back you may remember that the issue was raised at Prime Ministers Questions which was another step along a lengthy campaign for change. Since then, there has been a lot of work by other parents on various NHS committees where they’ve cajoled and advised to the point where the Daily Mirror published this today. Here’s a link to the article in case you can’t read it. 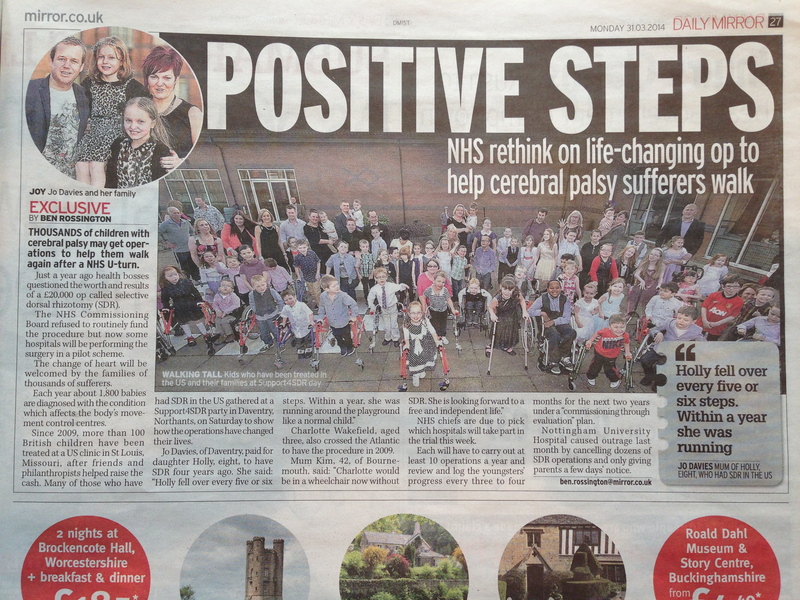 It’s great news and it’s brilliant to see a positive story about SDR on the NHS in print. In truth, there has been no dramatic shift in the last 24 hours. The decision to begin funding on the NHS in England has gone through many stages but it is hoped that within the coming months commissioning will begin. For me, the moment when any child who meets the criteria, regardless of funding, can get access to the surgery they need on the NHS can’t come soon enough. If you look closely at the photo you can see Rhys on the right in a Man Utd shirt. 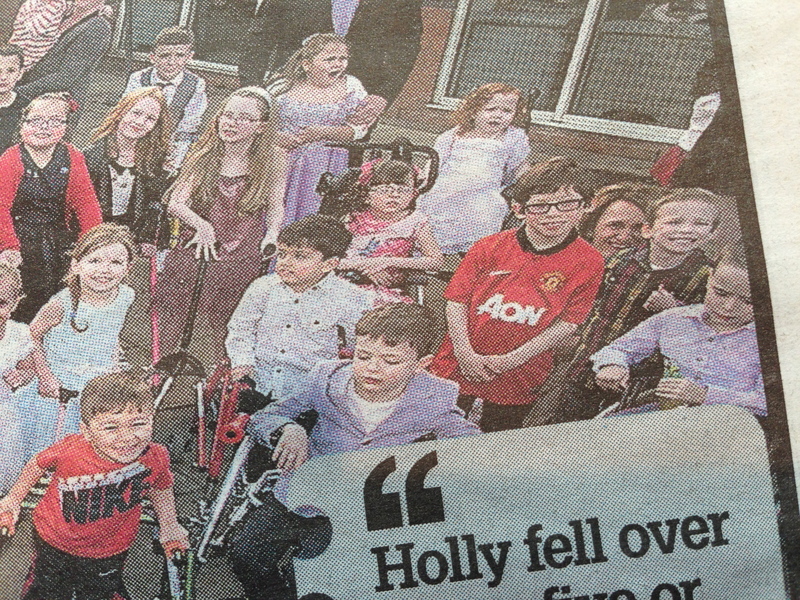 The picture was taken at the annual Support 4 SDR party on Saturday. It’s the first time we’ve been able to get a ticket (they sell out fast). A group of the first parents to go to St Louis organise it each year – it’s quite, quite brilliant to see a hotel lobby full of kids all of whom have had SDR. What’s also remarkable is that the surgeon, Dr Park and some of his team take time out of their schedule, and travel from the US to attend. Somehow he seems to remember every child that he’s operated on in such a detailed way that seems impossible. But he does. Chatting to him it’s clear that he cares about these kids. He then spent about 3 hours straight, on the dancefloor with an army of SDR children, never once missing the chance to dance with someone showing off their new found ability. In fact, the whole US team were endlessly friendly, having photo’s taken and chatting to parents and kids, way past the point when we took the boys off to bed. The following morning, we said our goodbyes to the other SDR families we know. For some of them its 4 or 5 years since they packed up their hopes in a suitcase and went off to St Louis to have their lives changed. Since they returned they’ve given their time and effort to create change for others, and hopefully in the coming weeks that effort will be repaid.